Plant growth in an indoor garden is obviously affected by light, temperature, and nutrition...but some of the other factors influencing growth (like pH) can be a little more difficult to get a handle on. 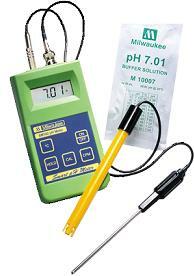 The correct pH levels can be maintained by closely following a carefully chosen, quality feeding plan, but more often a pH meter is needed to help check and correct pH fluctuations. The ideal pH range for hydroponics is about 5.8-6.2. For soil, it is about 6.5. The reason for the difference is explained more below. With hydroponic methods, beneficial micro-organisms traditionally play a much less significant role in plant growth than gardening in soil. Instead of relying on micro-organisms to help chelate and transport nutrients into the plant, fresh nutrients are continuously brought into contact with plant roots by the hydroponic system. Maximum nutrient absorption rates under these circumstances tend to occur around 5.5. The how to grow hydro page covers in more detail exactly how to maintain the proper pH level in your nutrient reservoir. When gardening in soil (especially organically) nutrients are not constantly brought into contact with the roots by a hydo system. Instead, micro-organisms living in the soil produce complex carbohydrates that the plant uses for energy, living enzymes that facilitate a number of biological activities in the plant, and fulvic/humic acids which chelate large nutrient molecules into smaller molecules that the plant can absorb. Furthermore, beneficial fungus in the soil called mycorrhizae act as a very substantial secondary root system and help transport these substances to the plant's roots in exchange for substances excreted by the plant's roots which the mycorrhizae use as a food source. In order for these processes to occur, these beneficial micro-organisms need to be kept happy and working efficiently. These mico-organisms prefer a pH of 6.5. Therefor, when gardening in soil organically this is the pH value you want to be at. The easiest way to adjust the pH in an organic soil mix is to add two or three teaspoons of hydrated lime for each gallon of soil mix. Another option is to use a quarter cup of clean wood ash to every gallon of soil mix. This will add phosphorus to your soil mix as well as adjust the pH. Take a look at some good soil recipes here.